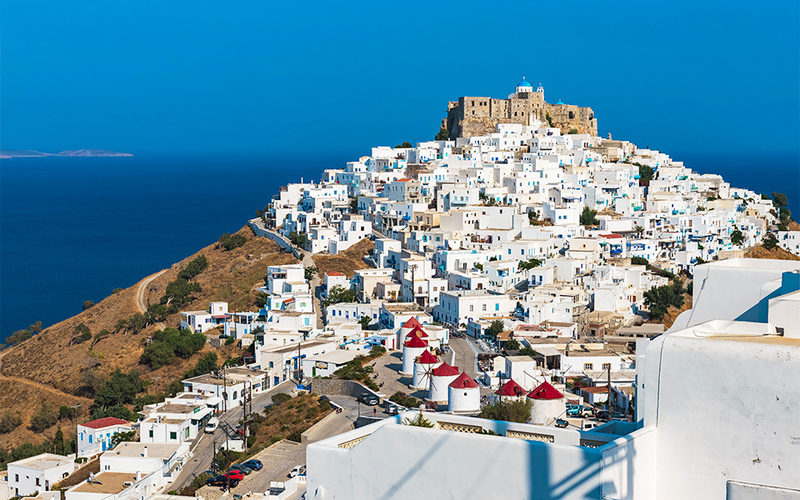 Astypalea's remoteness has allowed it to develop into a destination for quality, alternative holidays says the island's deputy mayor for tourism. Butterfly-shaped Astypalea, located in the Dodecanese in the southeastern Aegean, is one of the more remote Greek islands, a fact that contributed to it largely missing the wave of rapid large-scale tourism developments in the 80s and 90s. But for many, this has been a saving grace of the island which is now pitching itself as a quality destination for discerning travelers. 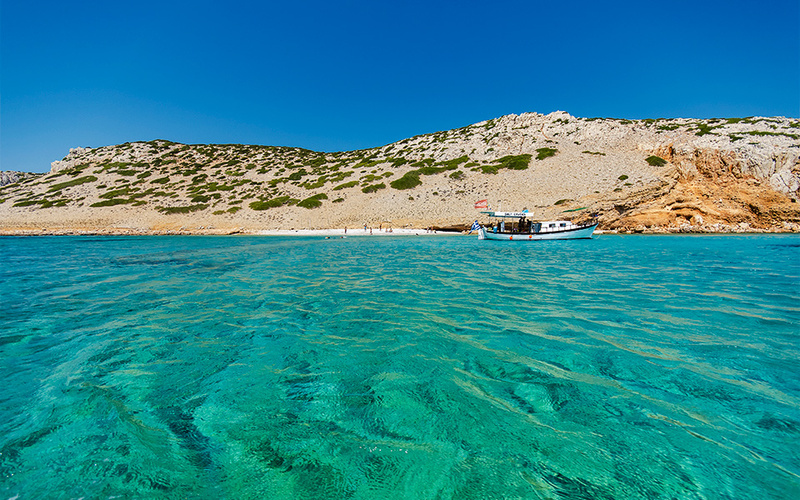 A few weeks before the tourism seasons gets under full swing, Maria Kambouri, Astypalea’s Deputy Mayor for Tourism, takes us 117 miles from Piraeus to one of the best-kept secrets in the Greek archipelago. Give us a sense of what the island is like at this time of year, shortly before the tourist season starts. We are all working like mad; from the second half of April, the municipality and the locals alike make the final push. We are whitewashing village streets, courtyards, homes, cleaning open spaces, shop owners are readying their businesses and hotels are fully staffed. These are the days that we start welcoming the first foreign tourists who come for the treasures of Astypalea in spring. These they discover walking the paths through the flower-filled landscape – many of the paths pass through traditional creameries making local cheese. A few of the more brave have a swim in the crystal-clear but still chilly sea, but the beaches are cleaned thoroughly from the second half of May, because until then the weather is unpredictable. From the beginning of the season an additional ferry line is added from Piraeus as well as three flights from Athens per week. What secret of the island would you share with a visitor? I think the goal is for them to discover their own favorite locations, their own sources of relaxation to recharge their batteries. Everyone makes their own Astypalea. Some want to walk up to the castle of Ai Gianni to see the marvelous sunset, others to stay until late at night relaxing under the stars at the beaches of Vatses, Kaminakia, Koutsomyti, Kounoupes and others. Still others prioritize visiting archaeological sites: the Tarara Baths with their gorgeous mosaics or the one-of-a-kind infant cemetery. Some are looking for relaxed family holidays while others want to dance the night away. 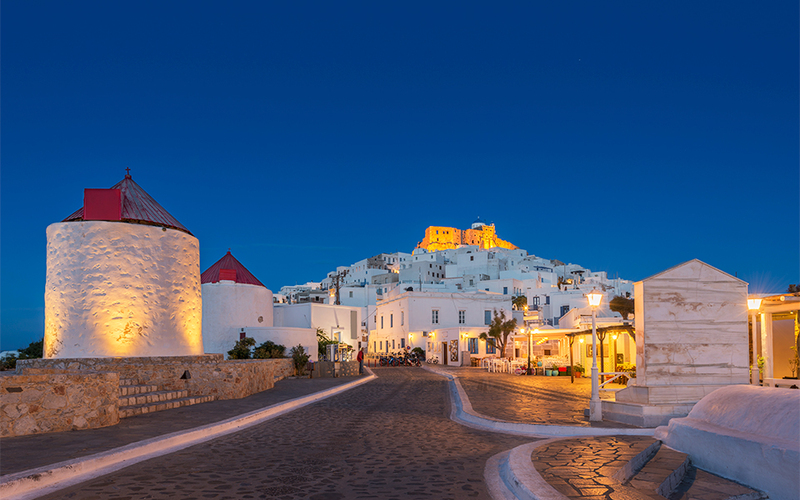 One thing that many don’t expect is that on Astypalea the nightlife goes on until the morning. What will a visitor find today on Astypalea that they wouldn’t have found 20 years ago? Has its image as a tourist destination been upgraded? The island has changed for the better and is evolving along with the needs of its visitors. The provision of services in the area of gastronomy as well as in hotels is at a very high level. 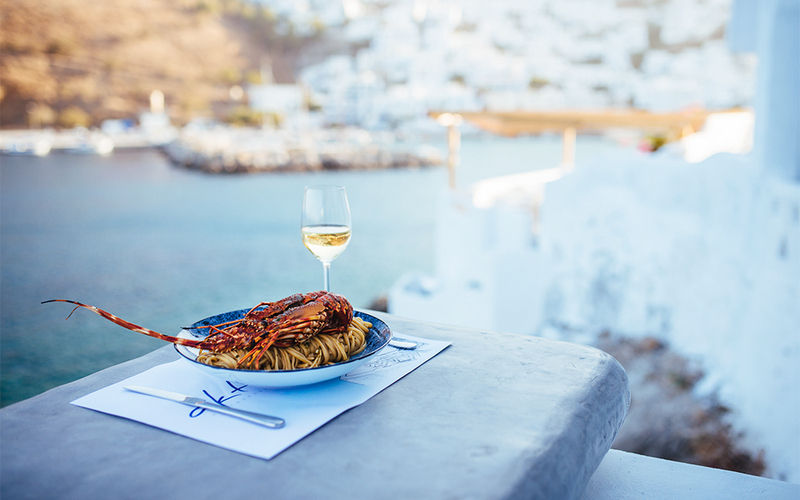 One can find anything from boutique hotels to traditional houses with wooden, intricately hand-carved beds; from fish tavernas in fishing villages that have been untouched by time to restaurants that are taking local cuisine to new places. But the fundamental qualities that make up the character of the island remain unchanged. These are authenticity and hospitality, which give holidays here an alternative feel. What nationalities tend to visit the island? Italians are among the travelers who traditionally choose Astypaeia, as are Greeks. In recent years however, it is with great joy that we have seen more and more German tourists visiting the island and that is not by chance – it is the result of a systematic promotion effort that was undertaken in the German market by the tourism committee of the Astypalea Municipality. How would you describe the ‘Astypalean rhythm’ to someone who has not been on the island? When someone first arrives on the island they have the sense of being on a quiet and serene destination and are not expecting much by way of nightlife. But from the first evening they will realize that things are totally different because suddenly the empty streets fill with people. Locals and visitors join to become one group having fun until the morning to both traditional and contemporary music. 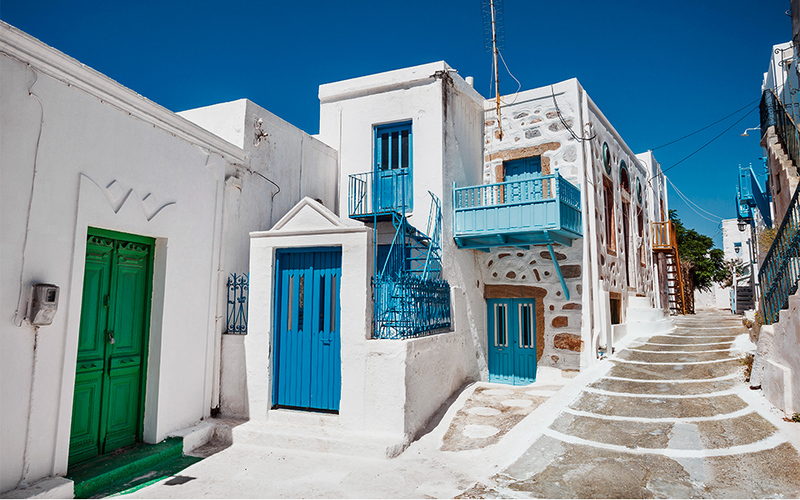 Astypalea has something unique: it has the power to embrace the traveler, to remove their burdens and concerns and to draw them immediately in to the island’s rhythm. Both visitors and locals adopt this relaxed program: they’ll have a siesta after the beach and wake up at night to go out for a drink. The nightlife however does take place with respect to the island. The entire island does not vibrate with heavy bass and loud music. Do you consider the traditional festivals part of the touristic experience? Is it an experience that visitors enjoy? 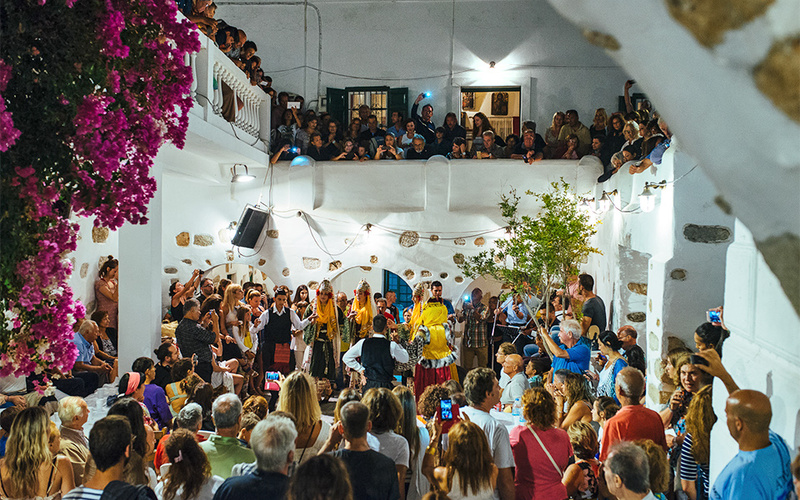 Visitors have an overwhelming interest in the traditional festivals which take place in the summer, such as the feast days of Aghios Panteleimonas and of Panaghia Portaitissa, the latter of which takes place at the castle on the 15th of August. I think that that’s what many visitors are looking for: authentic and traditional festivals. 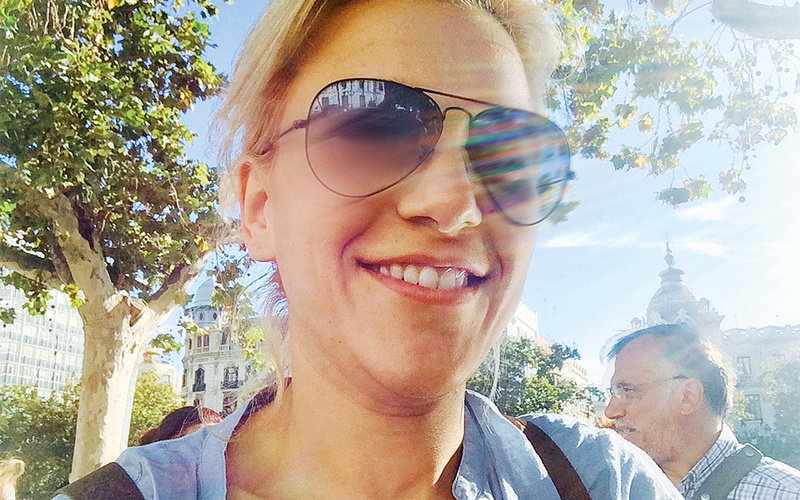 It takes 10 hours by boat from Piraeus and one arrives in the early hours. Is it a good or bad thing that Astypalea is not the easiest island to get to? Mass tourism never interested us. We would never sacrifice Astypalea’s alternative profile on the altar of all-inclusive packages. Authenticity is the element that sets us apart from the other islands and the infrequency of the boats helps the island remain unspoiled. That, after all, is its charm! On the other hand we are exploring all options to extend the tourist season and increase the number of visitors to the island throughout the year. Changing the hours of the daily ferry boats to and from the island would, of course, help with that. This year we have seen a very significant increase in tourists for the months of June and September. Our goal is to maintain that and strengthen this influx and of course extend the tourist season from April to October. One other thing we are also seeking is the promotion of Astypalea as a destination for day-trips from Santorini and Irakleio in Crete.